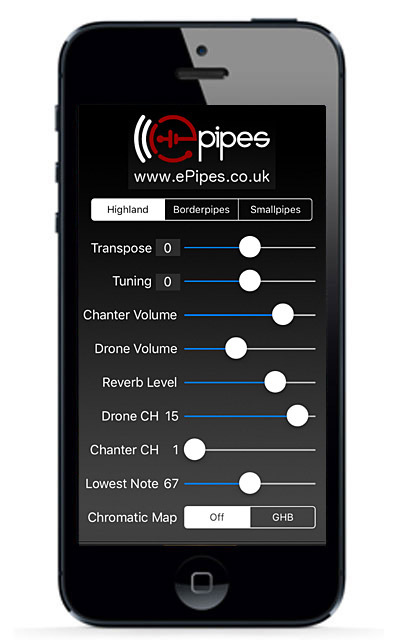 Based on per-note sampled sounds, "ePipes - MIDI Bagpipes" is three realistic sounding sets of sampled bagpipes for the iPhone/iPad that may be played using a MIDI chanter such as the Fagerström Technopipes. Start/stop the drones playing by touching the ePipes logo. 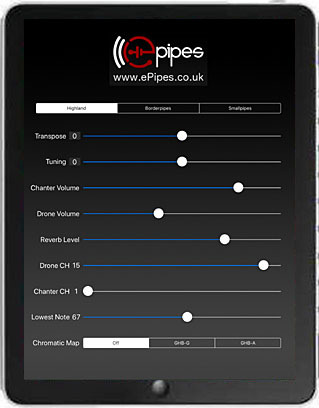 Use the Volume controls to set the balance between the chanter and the drones. Use the Reverb control to change the drone and chanter reverb level. Use the Drone Channel slider to set the MIDI channel for the drones. Use the Chanter Channel slider to set the MIDI channel for the chanter notes. Use the Lowest note slider to set the MIDI note bottom note of the chanter. Range is from 55 to 79. The drones will start upon receiving any MIDI Note-On event with the note number less than 80 on the drone channel. A MIDI Note-Off event with the same note number that started the drones on the drone channel will stop the drones. Once set, the MIDI parameters are saved when exiting the app. 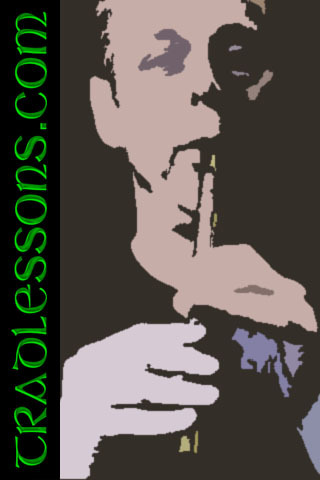 Pipe Major William Robertson has an extensive set of free online Highland bagpipes lessons. City of Winchester Pipes and Drums in Virginia has a very nice collection of tunes in standard notation as .bmp images. The Fort Collins Pipe Band has many tunes online, also some solo marching drum recordings. There is a wealth of information online at Bob Dunsire Bagpipe Forums. Apple, iPhone, iPod Touch, iPad, and the Apple logo are registered trademarks of Apple Inc. in the USA and other countries.